Paintings of rich, rural scenes pay tribute to the grit and strength of Douglas Wiltraut’s subjects, their environments and their homes in a manner akin to Regionalism or the American scene painting movements of earlier eras. Here, romantic conceptions of farm and yard, child and worker are cast in dramatic sunlight with a quiet and reserved beauty. We see signs that Thomas Hart Benton has been here—and Winslow Homer and Andrew Wyeth, too. 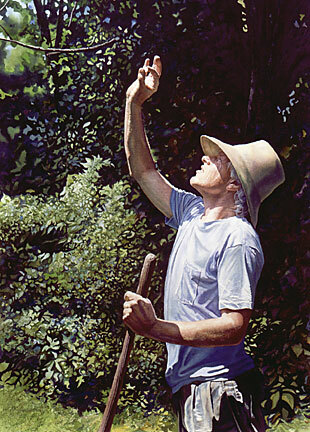 In the dappled sunlight we may think of Vermeer and perhaps of Velázquez, influences Wiltraut is quick to point out. 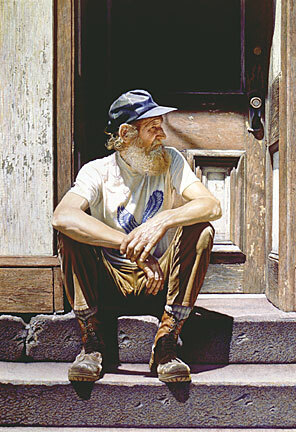 Intrigued by what he refers to as “the patina of life,” the artist often paints pictures that celebrate the proof of time’s effects. 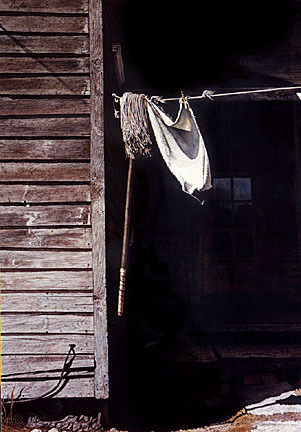 “I’m intrigued by the passage of time,” he says, “and the evidence of that passage on people or objects.” In works such as Cracked Rib, The Silent Ax and Mare’s Tail, retired objects assume primacy in their respective compositions, while Gutted and Bone Dry pay homage to vacant structures beyond the point of usefulness. 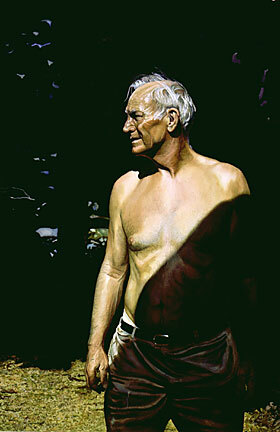 For works that contain figures, such as Family Man or Looking at the Moon, Wiltraut begins with the face and skin. “I try to get the facial area fairly close to what I want it to look like before proceeding to the other areas,” he says. “If the face doesn’t turn out right, what’s the point?” Using the English watercolor method, Wiltraut brushes a clear passage of water over the chosen area of skin first before applying a single color to this newly wet spot. After the color dries, a second passage of clear water and a second color are introduced to the same area of the paper. This process continues, layer by layer, until the desired pastel-like skin tone results, he says. Textures and details are added later to these layers with drybrush techniques. Be it a still life, an architectural landscape or yardscape, or a portrait, Wiltraut’s paintings overwhelmingly express reverence—and wonder—at the space, time and place of their subjects. 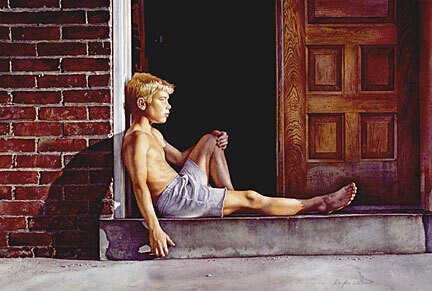 In Setting Son, we see a young boy—the artist’s son—at rest on the cool, front stoop of a relative’s home after a long day of outdoor play. As the sun casts his face in a healthy glow, we can’t help but notice the shadow gaping behind him from the open front door—and the interior adult world waiting beyond it. A painting as much about growing up as it is about the pleasures of childhood, the work tempts us to see here a portrait of the artist himself as a young boy and the breadth of time from present to past. Meredith E. Lewis is a freelance writer and editor based in Manhattan.